When the forecast says snow, snowmobilers say go. And in Northern Michigan that "go" means fun! With miles and miles of trails crisscrossing our rolling and scenic terrain, local snowmobile clubs devoted to creating and maintaining trails, lodging, dining, and more, Northern Michigan is the place to bring the snow sleds in the winter. Thousands of snowmobile enthusiasts head north when the snow flies because of our extensive trail system, terrific snow and terrain, and plenty of lodging and friendly pubs and taverns along the trails for great fun. Most of the trails in Emmet and Charlevoix counties are on state of Michigan land, although many area clubs have easement crossing agreements with property owners. Some Northern Michigan routes include runs on county roads. 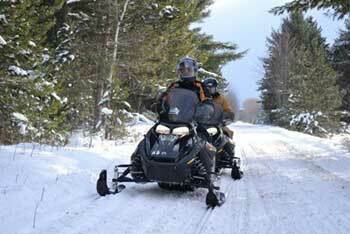 Emmet County Snowmobiles are banned from Emmet County roads. There are a few exceptions where the roads are part of the state trails system. Petoskey No snowmobiles on city streets. Harbor Springs Snowmobilers using trails north of the city can enter Harbor Springs on a route from the baseball park/ice rink on Hoyt Street to the harbormaster's office on the waterfront. City residents with snowmobiles are allowed to use city streets to drive in and out of town using the most direct route and obey all traffic laws so if you see a snowmobiler in town, they may be a resident; visitors cannot do the same. 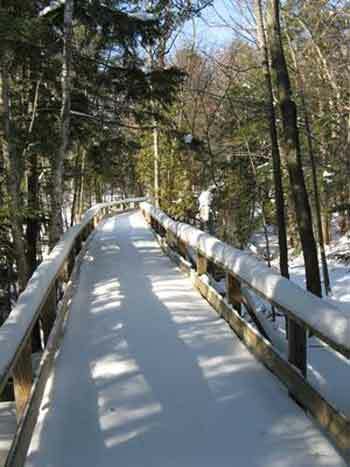 Alanson A designated, signed snowmobile trail runs through Alanson and residents may ride to the trail using the most direct route. A snowmobile parking lot can be fount between East and Warren Streets. Pellston Snowmobiles may ride through Pellston observing a 10 mph speed limit on the north-south trail following the old railroad right of way (avoid Pioneer Park). Residents may take the most direct route to and from the trail. Charlevoix County Right of way or shoulder travel is permissible in some locations but stay on the trail where possible. Charlevoix Limited snowmobile traffic is allowed only to reach trails. Boyne City No machines are allowed in the downtown area. Shoulder use is allowed but snowmobilers are to stop at all intersections regardless of sign postings. Boyne Falls Shoulder use is allowed to get in and out of the town. Trail maps can be found at the area chambers of commerce.